We recently featured Dukto a free and easy way to send and receive files using wifi between pc and mobile devices, but does that mean we should ditch bluetooth transfer in favor of wifi? Lets find out. As you can see from the table below, Bluetooth's low power consumption and ease of use is ideal for mobile phones and other small devices. Example of usage is bluetooth headset and headphones, sharing of small files etc. And while bluetooth offers very minimal power consumption, wifi on the other hand provides faster transfer rate on the expense of energy usage. Its really a case to case scenario. If you are sending large files (30mb+) , its better to use wifi transfer since even though wifi uses a lot of power, the time it needs to transfer the file is short (around 2-5 seconds) , while if you use bluetooth , though it only uses less energy compared to wifi, transfering a file for about1-2 minutes, the power consumed could easily add up to or even greater that what is used by wifi transfering the same amount of file (remember some mobile phones doenst turn off the display when sending files to show the progress of transfer - and displays are one of the major consumer of electricity). Sending small files on the other hand would be better on bluetooth since its easier to setup connection and transfer times not that too long compared to wifi. Also, using Wifi is only feasible if there is an available access point. So even though you wanted to use wifi, if there's no access point for you to connect to, you won't be able to establish a network. 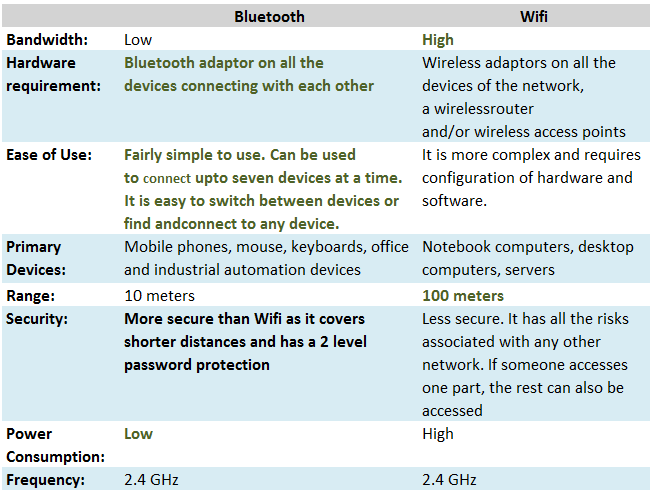 Bluetooth on the other hand can connect to other device even without access point, they do this by what we call Device Pairing.